Wouldn’t it be nice if you could print out interesting sites or documents from your phone while lying on the couch using your Wi-Fi connection? 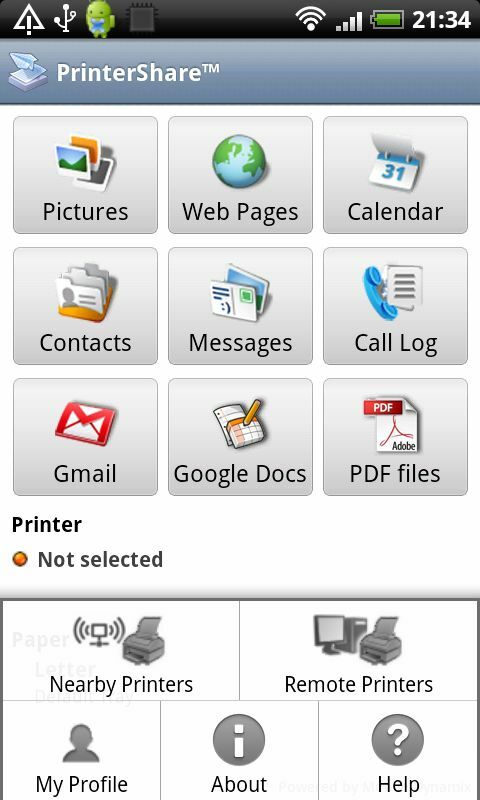 Find out how to print from your Android phone in today’s test report. 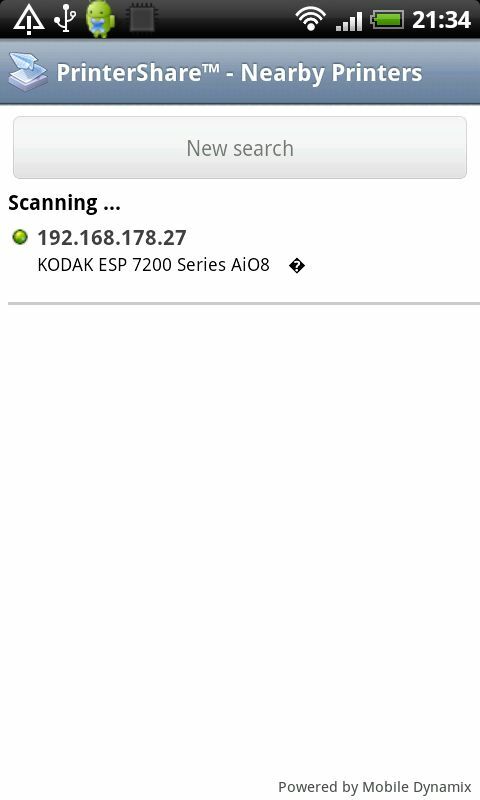 When I started up the app it couldn’t locate my Kodak Wi-Fi printer. Pressing Nearby Printers is supposed to scan for any wireless printers your immediate area. Unfortunately, the app failed to connect with my printer and I was forced to manually set my printer’s wireless connection. After I had figured out my printer’s wireless configurations, I tried looking for it again and the app managed to locate it. Just as I thought I could finally print something, a message appeared on my screen telling me to download free software to my computer. Why the hell do I need to download additional software if my printer has already been located? OK, so I download the 1.9 MB size file and install it onto my computer hoping that this would finally get the darn thing to work. After installation the PC program showed me an overview of all available printers that I could lock or use. Then I had to restart the app in order to connect with the PC program and the printer. After reconfiguring my printer all over again, my printer was finally appeared in the printer list. But here’s the worst part: you can only print a test page wirelessly with the free version. So you are basically given no choice but to purchase the premium version in order to use the app properly. Furthermore, you are required to register if you want to use the app in local mode and you’re limited to just 20 pages! Any additional pages are going to cost you some money: 100 pages for $4.95. The upgrade to the premium version would cost you $9.95 per month. That’s quite a bundle of money for so few options. I’d rather just get up off the couch and print out myself. I decided not to buy the upgrade but I would still like to mention some of the premium version features. In Pictures you send photos directly to your printer to be printed out instantly. You also have the option of printing out entire websites. Your calendar entries can be printed out for you to have on hand as well as all your contacts on a single page. Even text messages can be printed, although I don’t see why anyone would need to do that (unless they need to use them as evidence in court). 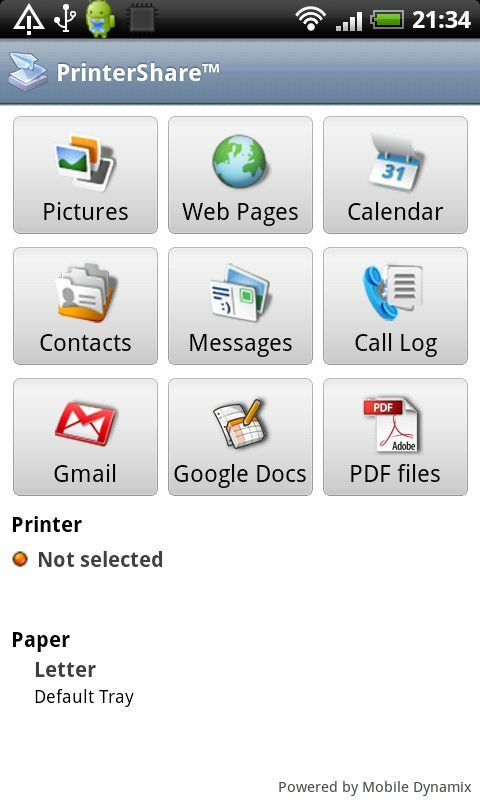 With Google Mail you can print out emails and use the Google Docs option to print out your online files. Last but not least, you can print PDF files. All in all the app is really interesting, except for the fact that you have to purchase the premium version in order to truly enjoy all the functions. Therefore I can only recommend this app to those that are willing to pay for it. I could imagine this app being pretty useful on a tablet. Easy to understand menus, all options can be accessed via the menu button – a really user friendly app. PrinterShare didn’t crash or experience any glitches during my test. Except for the fact that my printer couldn’t be located immediately, I can’t criticize anything in this category. This version can be downloaded for free from the Android Market. Most of the useful options are available only in the premium version, however.